There is something of a change afoot. We are on a wave that has many businesses looking to reinvest in their systems and processes. This interest is especially true in relation to financial control solutions software. The drivers are varied, but generally the lack of investment has also created a lack of capability within the organization for flexibility, growth in maturity as well as quality and quantity of service. Now those particular constraints aren’t going to come as news to many. They have been lived with for years. Decades even. Businesses, however, are waking up to realize that repeating the pattern of neglect is leaving them seriously vulnerable. They will not be able to adapt to a changing client base, rotating vendors, a changing competitive landscape and to an increasingly demanding regulatory environment. There is a real appetite to undertake new investment and a chance to right the wrongs of the past. All that technical debt, those legacy systems, the repeated bumping of the head and the hard to break-away from status quo of disparate people and their special ways? We can leave them all behind! Finally. There’s a tremendous opportunity here to seek out and implement the “modern” solution – to retool and put the business on challenger footing. Who is flexible? “We are.” Who can scale? “Right here.” Who is empowered to operate with continual improvement? “Me. I mean us.” At least that is the way it should be having properly seen the opportunity through. So now what? How to go about finding this Holy Grail? The mission is daunting even with the lessons of the past so fresh. I’ve got some rules for you to consider as you explore your options. These rules are very pertinent as you look for a new financial close management and account reconciliation software solution. and other solutions that fall into the Enhanced Financial Controls and Automation (EFCA) space. They are equally valid for any system solution that you will utilize to drive efficiencies and create beneficial change in your work area. Keep them close and, hopefully, they will ensure that this significant opportunity to bring new value to the business and new life to the operation will be successful. Imagine a solution where every team member is capable of being a “guru” and yet, paradoxically, gurus aren’t necessary. The modern solution should offer capabilities freely and intuitively such that the team is self-sufficient to solve its members’ own issues and conduct new configurations. Dependency on specialist resources in the team or resources outside the team (such as IT) should not be required. The team should be experts in their own systems and operations. They should be self-healing and constantly adaptive. The environment is constantly changing – new vendors, new points of integration, new work responsibilities, new volumes of work. The modern system will easily accommodate these changes and not just to the extent that it simply allows for these changes. It will support changes so that they can be addressed quickly as well. A system that inherently supports change will inherently support incremental change. This is without respect to whether the change is related to deliberate step-change or whether the change is organic and necessary after being put into operation. There is a major benefit to this capability especially when the systems involved are critical to the group. This capability sidesteps the need for a “big bang” implementation and de-risks transition and transformation. Your modern system should not limit your ability to service work from any location. Whether you plan to field regional teams, implement a shared follow-the-sun approach or do full operation center consolidation, the modern solution will support all models. This is a particularly valuable capability when work re-location is a part of the modernization process. The platform itself should be consolidated and allow for minimizing hosting costs. The consolidated solution makes auditing and reporting from the single solution repository readily available. One of the finer forms of empowerment of your business team is the insight and ability to undertake continual improvement. The modern solution turns the idea of the stagnant status quo on its head by making the new status quo mandate “make it better every day.” Being able to analyze work progress and to optimize work quality and quantity are essential. Your modern solution should offer tools and capabilities to identify exceptions, backlogs and performance breeches while easily supporting their remediation. It’s easy to peg any discussion about solutions and “modern” as being related to technology. Certainly, technology is an interest. Your modern solution will be built using the latest, proven technologies with terrific headroom for transaction volume, expanding user base and broad adoption in the organization. It should have a low cost of ownership from a hosting and technical health-and-welfare perspective. As such it should be suitable for delivery via Software-as-a-Service or hosted internally using shared infrastructure and solution agnostic resources. Those should all be standard fair when considering your solution options. Technology alone, however, isn’t the differentiator for the “modern” designation. That designation only comes into play when the confluence of technology, user accessibility and feature set results in true team enablement. Always keep in mind, technology is not an end itself; it is not a “solution” itself. It is a means to an end. It is a real solution when – and only when – it allows you to master your operational environment, solve your problems, better your operational landscape, and can be leveraged well into the future. 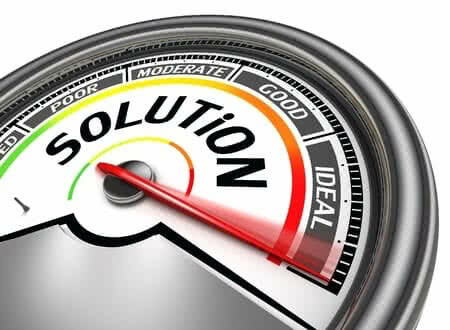 It should be a viable solution not just for your point issues of today, but a solution for your future needs as well. Finally, all these rules need to be tested. The good news is they can be tested easily in the course of a properly constructed Proof-of-Concept (POC). A POC should be a quick exercise to see how readily your team can be empowered by the tool and achieve the benefits of the new system. Do not make the mistake of thinking this is about re-implementing the current workload in a new tool! You are enabling the team to effectively operate appropriate processes and toolsets to support the current and future needs of the business – whatever they may be. Make sure you take that perspective starting in the POC, prove them in the POC and carry it through to the day-to-day when you take your modern solution live. And be concerned. The extent to which you cannot prove these points out in a POC means you are essentially rolling the dice when you move forward and try to operate your new solution. The stakes are high, so don’t leave your success up to chance! Conversely, each rule has a set of red flags. Rather than re-hash the rules the other way around, consider this: a modern reconciliation tool should not require extensive time to implement, train with, transition or operate. If your target system requires a grand sum to implement and a lengthy deployment, expect that to reflect in your true, total cost of ownership. If you cannot assume the proper level of business ownership in your POC, what does this portend about business ownership and self-sufficiency down the road? If the POC is expected to be a complicated and protracted affair, do you really expect that agility and self-sufficiency are supported in the solution? Make sure to engineer your POC to validate all the above rules and any particular elements of success demanded by your environment. If you are fortunate enough to assist your organization in finding new solutions and toolsets to transform your group, consider these rules and challenge your vendors to meet the demands of a modern solution.